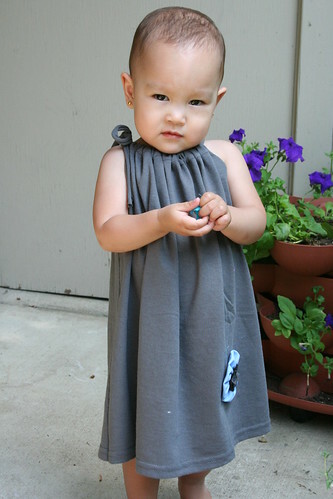 Jenny sent me an e-mail on Thursday asking if I might, perchance, be able to whip-up a sundress for the completely ADORABLE little Anika. It seems that they are having family portraits done and her family chose black, grey & light blue as the colors. Since the clothes were supposed to be predominantly black or grey, they were having some trouble finding a sundress. Now, how could I say no to that? Having my own little boy is great and all, but nothing compares to getting to play dress up with this sweet little doll. I used the standard pillowcase dress pattern that you can find pretty much everywhere (There’s a good tutorial/example at Prudent Baby), except instead of a pillowcase, I used an dark grey, XL men’s t-shirt that cost $3.99 at ACMoore. There are so many pluses to using a t-shirt! My two favorites? You can use the hem of the t-shirt as the hem of the dress AND you don’t have to finish the armscyes (jersey doesn’t fray)! Also, it’s just a comfortable, breathable fabric, perfect for summer. Why else would they make t-shirt out of it? 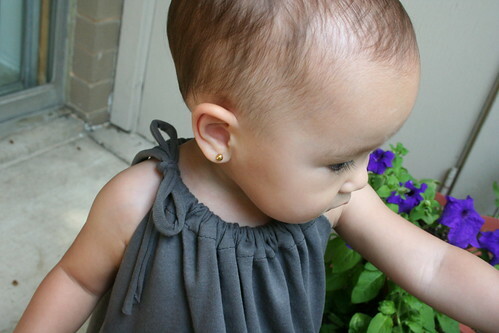 I used the dress she was wearing (a little jersey sundress from H&M) to figure the length and the armsyces. Initially, we were going to use a fabulous polka dot trim on the bottom of the dress but I’m glad we didn’t – I think it would have made the dress too heavy. 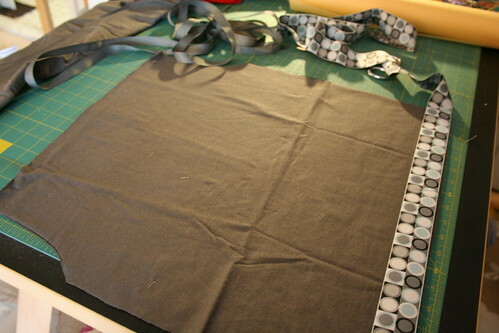 I used the serger for the side seams and the sewing machine to make the channels in the front and back for the strap. We used a stretched out piece of the tshirt to make the wrap around strap and tied it just on one side (like the smaller of the two dresses in the Prudent Baby example). The flower is a simple yo-yo of light blue linen with a small circle of black felt, a circle of the grey t-shirt and a shell button layered on top. All told, the dress took about 2 hours, but that includes time for socializing, making decisions about the design, taking pictures and threading my serger. If I’d just been sewing straight through, it probably would have been more like 1 hour! Tagged 2012, ACMoore, Anika, black, cotton, dress, flower, grey, jersey, July, light blue, linen, pillowcase, Prudent Baby, summer, sundress, t-shirt, yo-yo.